Can you be charged with a crime if you leave the scene of an accident? Yes. You may be charged with leaving the scene of an accident in Florida. Is this a serious criminal charge? Yes. Depending on the damage or injury involved, you may be charge with a felony or misdemeanor crime. A hit and run charge may also affect your driving record and could lead to a suspended Florida drivers license. (a) The driver of a vehicle involved in a crash occurring on public or private property which results in injury to a person other than serious bodily injury shall immediately stop the vehicle at the scene of the crash, or as close thereto as possible, and shall remain at the scene of the crash until he or she has fulfilled the requirements of s. 316.062. A person who willfully violates this paragraph commits a felony of the third degree, punishable as provided in s. 775.082, s. 775.083, or s. 775.084. 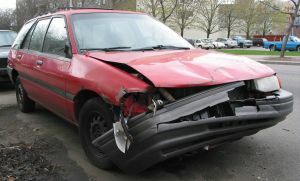 (b) The driver of a vehicle involved in a crash occurring on public or private property which results in serious bodily injury to a person shall immediately stop the vehicle at the scene of the crash, or as close thereto as possible, and shall remain at the scene of the crash until he or she has fulfilled the requirements of s. 316.062. A person who willfully violates this paragraph commits a felony of the second degree, punishable as provided in s. 775.082, s. 775.083, or s. 775.084. (c) The driver of a vehicle involved in a crash occurring on public or private property which results in the death of a person shall immediately stop the vehicle at the scene of the crash, or as close thereto as possible, and shall remain at the scene of the crash until he or she has fulfilled the requirements of s. 316.062. A person who is arrested for a violation of this paragraph and who has previously been convicted of a violation of this section, s. 316.061, s. 316.191, or s. 316.193, or a felony violation of s. 322.34, shall be held in custody until brought before the court for admittance to bail in accordance with chapter 903. A person who willfully violates this paragraph commits a felony of the first degree, punishable as provided in s. 775.082, s. 775.083, or s. 775.084, and shall be sentenced to a mandatory minimum term of imprisonment of 4 years. A person who willfully commits such a violation while driving under the influence as set forth in s. 316.193(1) shall be sentenced to a mandatory minimum term of imprisonment of 4 years. If you were given a Jacksonville traffic ticket or arrested for a criminal driving offense, contact an attorney for help. Call (904) 564-2525 to speak with a Jacksonville criminal lawyer.